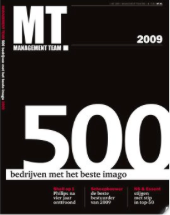 2009-09-13 In the spring of 2009 TNS Nipo on behalf of Management Team has determined which Dutch companies excel in popularity and image. Over 1000 managers (HBO+) were asked to name their favorite employer and business partner. Settels van Amelsvoort occurs in the list at position 311. In the list a total of 60 technology related companies occur. Within this group Settels van Amelsvoort takes place 46. Settels occurs at position 22 in the list of most favorite employers.